ALL GAMES AT LONG LOTS — BE READY TO START AT 6:15 PM SHARP! — EVERYONE MUST BRING A BALL! August 1: For the 2nd year in a row, the finals went to overtime. The match was scoreless through 37 minutes. Three minutes from time, Lefty Penderakis scored for #1-ranked Greece. But Emerson Anvari equalized 1 minute later, for #2-seeded France. Following Watermelon Cup rules, the game went to golden goal — but every 2 minutes, each team took 1 player off the field. With the field opened up, Matt Tanzer pounced on a rebound to give Greece the hard-earned 2-1 victory. Congrats to the Greeks on a well-earned win; to France for a worthy final, and to all for another successful Watermelon Cup season. 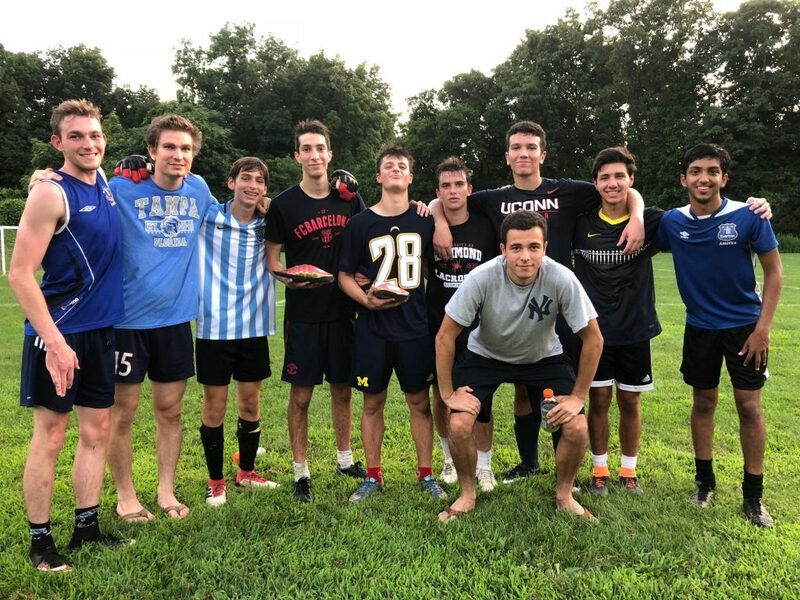 Greece: Front: Josh Berman; Rear (from left) Spencer Daniels, Reilly Lynch, Sebastian Montelieu, Austin Sholes, Mason Reale, Matt Tanzer, Lefty Penderakis, Alejandro Perez Elorza, Surya Balaji. Semifinals: #1 France vs. #4 Holland; #2 Greece vs. #3 Egypt. Finals to follow immediately afterward. See you there! July 18: Lots of action tonight. 5th-place Holland won twice — including an upset of co-league leader Greece. Nigeria also beat Greece, for its 1st victory of the season. Spain shut out co-league leader France. Sam New had 2 excellent goals, while Thomas Nealon scored on a spectacular bicycle kick. Next Wednesday is the final week of the regular season. Five teams are still in contention for the 4 playoff spots. — There were 3 ties in 6 games — the most ever in Watermelon Cup history. Holland and Spain both tied twice. — France handed Egypt its 1st loss — and then France suffered its 1st loss in the next match. — Greece won twice — and Nigeria and Holland earned their 1st points. — Timmy Liles set a Watermelon Cup record with 5 goals in 1 game. Remember: No games next week (July 4th). We resume July 11. Everyone should bring a ball! June 20: Timmy Liles’ goal with 3 seconds remaining lifted France to a 5-4 victory — their first of 2 on opening day. Egypt — without a keeper — also went 2-for-2. Greece and Spain won 1 match each. SCHEDULE — ALL GAMES AT LONG LOTS — BE READY TO START AT 6:15 PM SHARP! — EVERYONE MUST BRING A BALL! RULES — All games at LONG LOTS — Be there ready to start at 6:15 pm sharp! — Everyone must bring a ball! 1) 20-minute halves, running time. Approximately 5-10 minute halftime. Shin guards are mandatory. 2) 6-v-6 plus 1 keeper; if both teams agree, they can play 7-v-7 plus 1 keeper. Keepers may use their hands WITHIN REASONABLE AREAS. Subs may enter on any out-of-bounds or dead ball; no subbing on the fly. 3) No referees; call your own fouls. No penalty kicks. Watermelon Cup administrators* will be in attendance at all games, and may eject or ban players for egregious or repeated fouls. 4) No offsides, though goal-hanging is severely discouraged. 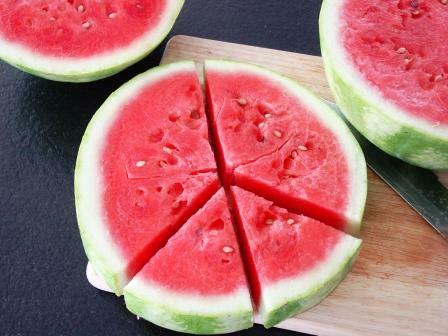 This is the Watermelon Cup; if you can’t play defense as well as offense, find another sport. 5) 3 points for a win; 1 for a tie. 6) *Watermelon Cup administrators: Dan Woog, Kurt Dasbach. Yes, Dasbach plays. He’s a very fair guy. This isn’t the Supreme Court. Get over it.